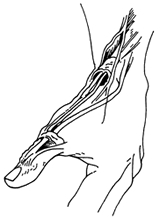 Figure 1: Swelling about the tendons to the base of the thumb results in painful motion. 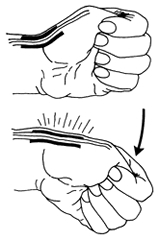 Figure 2: Finkelstein maneuver used to diagnose deQuervain's tendinitis. The goal is to relieve the pain caused by the irritation and swelling. In some cases, Dr. Smith may recommend resting the thumb and wrist by wearing a splint. Anti-inflammatory medication taken by mouth or injected into that tendon compartment may help reduce the swelling and relieve the pain. In some cases, simply not doing the activities that cause pain and swelling may allow the symptoms to go away on their own. When symptoms are severe or do not improve, surgery may be recommended. The surgery opens the compartment (covering) to make more room for the irritated tendons (Figure 3). Normal use of the hand can usually be resumed once comfort and strength have returned. Dr. Smith can advise you on the best treatment for deQuervain’s tendinitis. Dr. Smith provides a comprehensive multidisciplinary approach for the evaluation, treatment and care of deQuervain’s tendinitis. 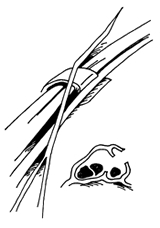 Figure 3:Surgery opens the sheath over the inflamed tendons.